Steve Ditko dies - RKMBs v9.0: Rob's Damn Boards .:|:. Man, that's a surprise. Although it really shouldn't be, I think we all knew he was old and had lived a very long life. I was surprised to read he was only 90! 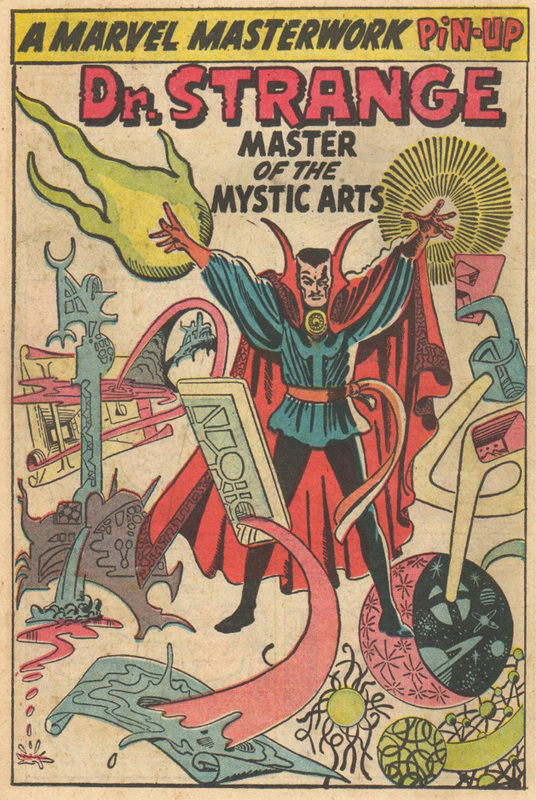 For me I'll always remember Ditko for his work on AMAZING SPIDERMAN and Doctor Strange in STRANGE TALES 110-146 (duh! ), but also for his pre-Marvel monster stories in JOURNEY INTO MYSTERY, STRANGE TALES, TALES OF SUSPENSE, TALES TO ASTONISH, and shorter series such as AMAZING ADVENTURES/AMAZING FANTASY, WORLD OF FANTASY, STRANGE WORLDS, and the like. I first discovered Ditko with The Creeper, his first appearance in SHOWCASE 73 was reprinted in 1974 in DETECTIVE 443, and I instantly fell in love with the character. The 6-issue BEWARE THE CREEPER series was among the hardest to find for me. I lucked on a copy of issue 6, and over several years tracked down the remaining 5 issues in reverse order back to 1. A lesser known series Ditko did was THE DESTRUCTOR for Seaboard Atlas in 1975, 4 issues that could be seen as a recreation of Spiderman. Also in 1975, STALKER for DC, that also ran 4 issues, one of the first series scripted by Paul Levitz. Aside from that, Ditko did a few series for DC that have a fan following but never really did much for me, such as SHADE THE CHANGING MAN, and a new version of Starman in ADVENTURE COMICS. And a lackluster The Creeper revival backup series in WORLD'S FINEST. In the 1980's Ditko did a nice run on the concluding 15 issues of ROM for Marvel. With a very respectable 75-issue run, I loved the series from the first issue as less of a superhero book, and more of a pre-Marvel-style alien silent invasion story, only done as a series instead of as a lone anthology story as all the others were. I love the Dire Wraiths as used in X-MEN and other titles. Sal Buscema did full art on the first 30 or so issues of ROM, and when inked for 2 years or so by Aiken and Garvey (around issues 30-50), the series developed beautifully. After those artists left after issue 55, Ditko was a very natural choice. As with Mantlo's MICRONAUTS, JACK OF HEARTS, and HULK runs, ROM was very consistent throughout its run, and that ended well with Ditko's run on the series. The last series I remember Ditko being slated to do was around 1993-1994 called DARK DOMINION, from Jim Shooter's Defiant comics line, that similarly had a secret spiritual war between the forces of good and evil theme, that I thought would have been perfect for Ditko. But despite being promoted in ads, Ditko for some reason walked away. Adding to the career-long perception that Ditko was very temperamental, and difficult to work with. I don't know if that was the case, but that is certainly the perception, when he left Marvel in 1966, when he walked away from DC in 1969, and again in this case. Ditko was reclusive, and at least for many years, he didn't meet fans or go to conventions. For those who find Ditko's work simplistic and bland, I'd point out that Frank Miller, Jim Starlin, and John Byrne, among others, manifest a profound Ditko influence in their work. And that his contribution to Marvel is second only to that of Jack Kirby. 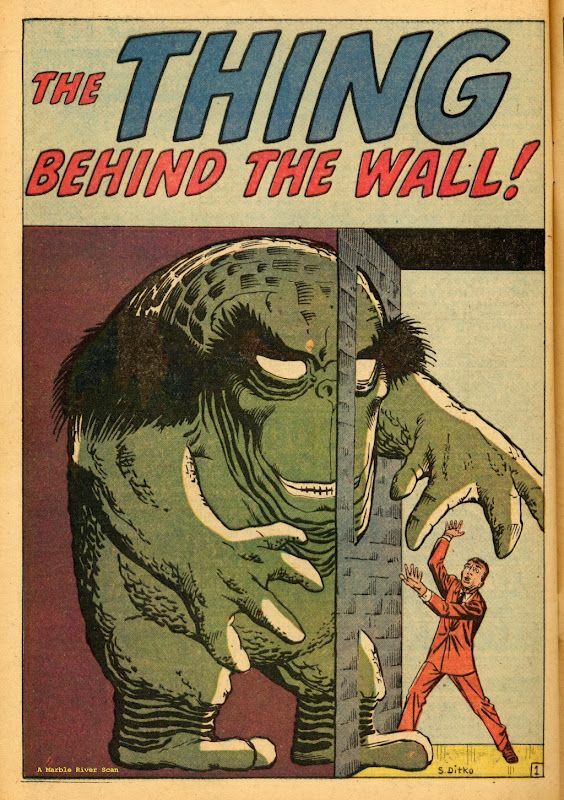 All the more remarkable because Ditko walked away from Marvel in 1966, back when Marvel was just getting started. For his continuity and visual style to resonate so long after such a brief tenure is testament to the impact of his work. I've also gained a further appreciation for Ditko because he originally came from Johnstown, Pennsylvania, where both my parents and the majority of my family is from, for roughly 100 years. As I mentioned in another topic, it's an interesting coincidence that I was introduced to Spiderman in 1975 when I got a pack of coverless comics in a 3-pack, and one of them was AMAZING SPIDER-MAN ANNUAL 6 (reprinting AMAZING SPIDERMAN ANNUAL 1 from 1964) that is the best annual I've ever read, and the best piece of Marvel self-promotion and crossover I've read, with cameos and promotion within this one annual for every series in the Marvel line at that time. What a wild coincidence to be introduced to Ditko's Spiderman in Ditko's (and my!) hometown! And to have only found out about that coincidence years later thanks to Wikipedia. As with so many great writers and artists, Ditko may be gone, but his work will live on and be loved by generations to come. This page from STRANGE TALES 82, March 1961. From JOURNEY INTO MYSTERY 66, March 1961. I have it reprinted in FEAR 7, May 1972. A little Ditko Spider-Man magic. 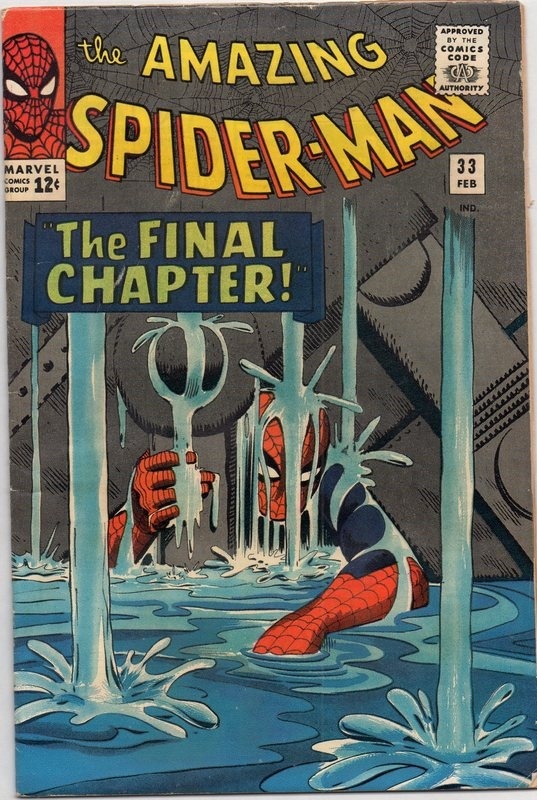 Ditko's last issue was AMAZING SPIDER-MAN 38. But some of his coolest art is in ANNUALs 1 (1964) and 2 (1965). And who doesn't love the reality-warping surrealism of Ditko's DOCTOR STRANGE? Artists such as Jim Starlin, Frank Brunner, Craig Russell, Marshall Rogers and Paul Smith, among others, have carried on well in that tradition. 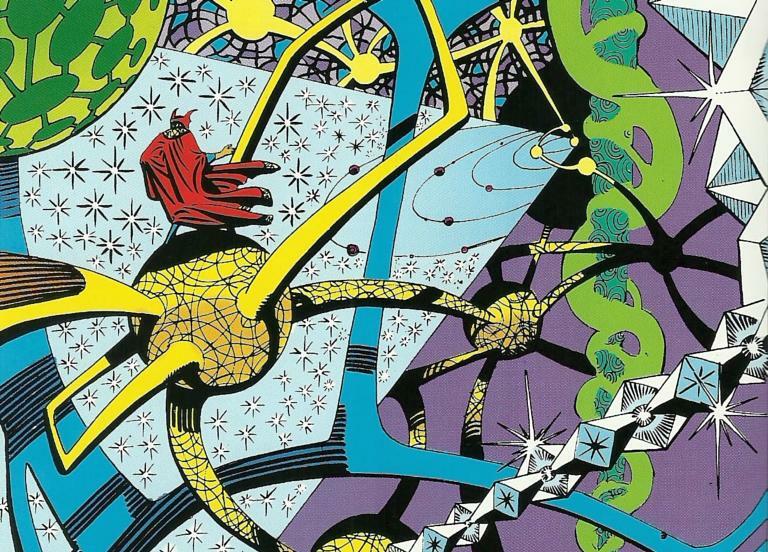 On DOCTOR STRANGE, and in other series that likely would never have been created without Ditko's work that preceded it. the best annual ever published. 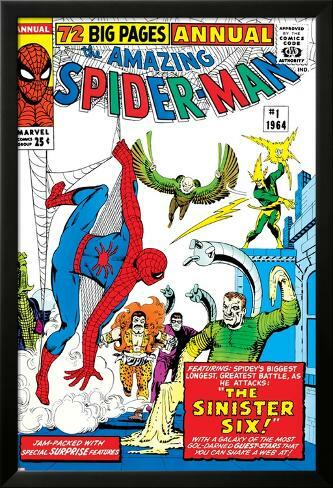 In a story that combines 6 of Spider-man's villains as "The Sinister Six", and in the span of a 41-page story fits in cameos and solicitation for every series in the Marvel line at that time. And also manages to fit in 6 full-page pin-ups within the story, of Spider-man fighting one-on-one with each of the 6 villains. The above link gives a sampling of 20 of the 41 pages. I never would have imagined an obituary for Ditko in Reason.com, but thinking twice about Ditko's objectivist obsession, it makes perfect sense! Also interesting that at least two of Reason.com's contributors other than Ditko come from the comics world. I have a few of Ditko's more avant-garde objectivist comics. In his creation of THE QUESTION, Ditko's objectivism came across a bit more calmly and rationally (I have the origin story in one of DC's MILLENNIUM EDITION reprints.) 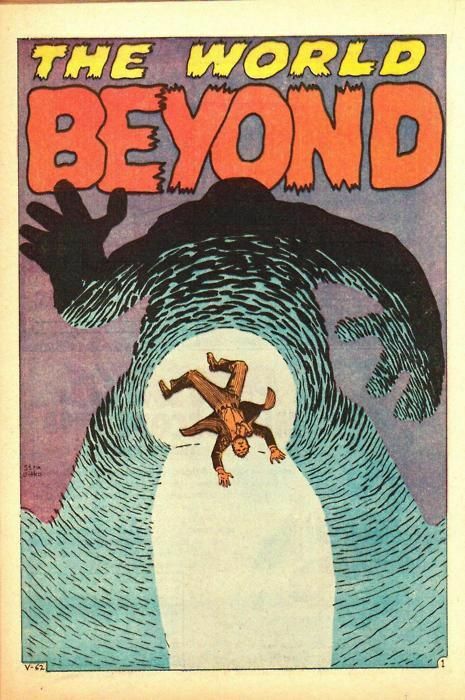 Ditko's later objectivist writings in comics are much further off the deep end, and rather than convert people to objectivism, I felt his comics just made it seem like an obsessively crazy notion. I (and probably many) tend to forget what a huge contribution Ditko made to the various Charleton heroes, that were later refined into Alan Moore and Dave Gibbons' WATCHMEN series. But without Ditko preceding them, there never would have been a WATCHMEN. I wonder what Ditko thought of Alan Moore's Rorschach. Say hi to Ayn Rand for me, Steve.